The Legal Genealogist had a ball yesterday talking about a wide variety of records that exist today because of an unusual set of laws. In Lincoln’s Laws and the Records of War, a webinar for Legacy Family Tree Webinars that you can now see free online through April 25, we looked at a whole bunch of things that we might not have — or not in the form we have them — if it hadn’t been for the formalization of the laws of war during the Civil War. Among the neat records we looked at were those involving deserters and spies, the huge volume of records of courts martial, and the records of interactions between the military and civilians. But — as is always the case in any time-limited presentation — we didn’t look at everything. That record group is one possibility for sure and should always be checked. But there’s another source that needs to be checked as well. The records may not be not a complete list — as the Descriptive Pamphlet makes clear, there were ultimately three units comprised mostly of foreign nationals who’d been drafted to serve in the Union Army and one that also included native-born Americans, and not all of their records survived, and there may have been individual cases outside of those units. And no, this microfilm hasn’t been digitized, at least not yet. The NARA website says the only copy is available for review at Archives I, the main Archives building in downtown Washington D.C. So it’s not perfect, but then what is, in genealogy? And it’s a great place to start if you’re looking for Union soldiers who ended up as Confederates. Check out the webinar for more ideas about researching records of deserters, spies, courts martial and civilians during wartime. And while this one’s free for now, note again, for the record — truth in “advertising” here — as a Legacy presenter, I do benefit financially if you buy one of my recordings or the whole webinar series. This time period is so fascinating! My Galvanized Yankee ancestor was courtmartialed for desertion only to have the court martial revoked by a special order I never found. Thanks to the good people at Fort Delaware, I learned about his actual court martial file. It has an opinion by the then-Judge Advocate General of the Union Army to the Secretary of War, who agreed, that the prison commandant didn’t have legal authority to convene a court martial, nullifying the decision that had been reached in my ancestor’s case. Wonderful new info about someone I thought was all figured out. Great story, Anne. Hope you’re writing this up. I have a German ancestor who was living in New Orleans when the Confederates took the city. His naturalization record claims he served for the Union, but the regiment and division listed on the naturalization record was a Confederate unit, not Union. Still looking for definitive records about what actually took place. Have you found him in the actual service records of the time? Either Union or Confederate? 1st and 2nd Louisiana Regiment New Orleans Infantry were galvanized Yankees. Many were Confederate deserters from Mississippi and Louisiana who joined the Union army to garrison New Orleans. 1st-6th U.S. Volunteer Infantry were Confederate POWs in the Union army. I found a Creek Indian from Alabama who went from the Confederate army to POW to Union soldier in one of these units in Kansas and Colorado. If you see a Union soldier born in a Southern state but enlisting in a place like Camp Douglas, Illinois this is what is going on. My galvanized Yankee served in the Alabama Infantry until he was captured north of Atlanta by Sherman’s troops. He wound up on the USS Susquehanna for the remainder of the war. He received a Union pension. Herman Sonnen’s CSR says he served from 22 July 1863 until 10 Aug 1863 in Co. F, 5th LA Infantry. There’s an H. Sonnen listed in Compiled Service Records of Confederate Soldiers Who Served in Organizations from the State of Louisiana , Affiliate Publication Number: M320 listed as serving in the Third Regiment, Second Brigade, First Division, Militia AND Third Regiment, Third Brigade, First Division, Militia. Job #1: making sure you’re dealing with the same guy and not just the same name. 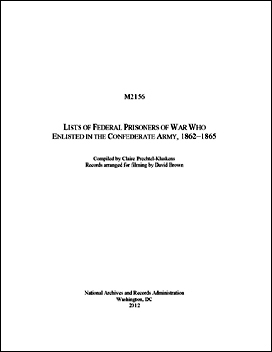 https://www.archives.gov/files/research/military/civil-war/galvanized-yankees.pdf and it includes a lot of the “usual” sources researchers should use for researching a person’s military service during that time period. And if there’s anybody who should know… (Readers: meet the author of the Descriptive Pamphlet for M2156, and a NARA archivist extraordinaire!) Thanks, Claire!